The Web Comfort Smartlet integrates automatic receptacle control with dimming and switching systems. The Outlet Controller switches 120VAC receptacles ON or OFF based upon occupancy, schedules, and demand response events. 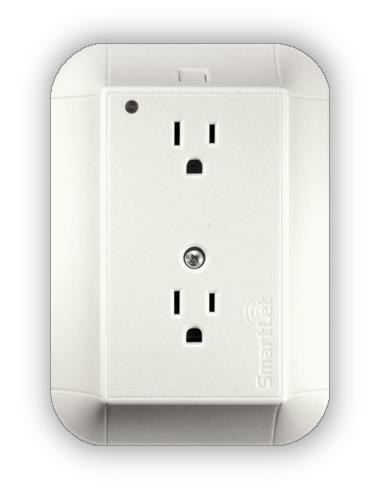 The Web Comfort Smartlet is attached to 15A/120VAC duplex receptacles, which power the device. The Web Comfort SmartLet Outlet Controller is wirelessly configured, scheduled and controlled by a Web Comfort Energy Manager. Dynamic scheduling allows the user to define ON and OFF events for receptacles, as well as periods governed by occupancy rules. Timeouts to switch off loads in unoccupied spaces are easily set per schedule or event, and can vary throughout the day. Connectivity between the SmartLet, Web Comfort Energy Manager and other devices is via the secure, reliable Web Comfort wireless mesh network.